The holidays can be a lot more fun when kids are involved, but there are a few things to keep in mind when celebrating with little ones. At the top of the list: Making sure the décor is kid-proof (glass ornaments could be a recipe for disaster) as well as fun and sophisticated (for both children and adults to enjoy). There’s also the important task of keeping the kids occupied during holiday gatherings. Not to mention being able to set aside time to simply enjoy the holidays with everyone, instead of running errands and stressing about hosting. Los Angeles-based designer (and mom of two) teamed up with and their new collection to share her advice for decorating and entertaining during the holiday season with kids in tow. Of course, Henderson wants her home to look “pulled together,” but the main priority is creating a home for her kids “where they can laugh and smile as much as possible.” Find out what she has to say about kid-proof decor, tapping into your inner child, and more. 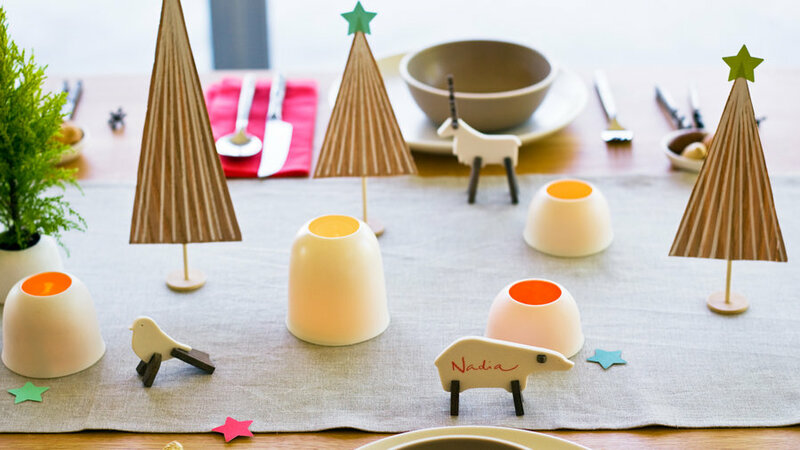 Even if you don’t have children, take advantage of the holiday season to bring some whimsy into your decor. Think Frosty the Snowman, Santa, and Rudolph. “It’s all about peppering the kid-friendly pieces throughout an otherwise adult space,” Henderson says. “Make sure the more youthful decorations you chose fit within the color palette you’ve already determined.” The holiday camper Henderson chose is retro-inspired for the adults, and playful for the kids. That means kid-proofing the space so you don’t have to spend the whole season worrying about the kids breaking anything or getting hurt. “Hang fragile glass ornaments only on the top half of the tree and use wood, plastic, or fabric ornaments on the bottom,” she recommends. Apart from the tree, Henderson suggests also displaying soft decor accents around the house (stockings, pom pom garlands, stuffed figurines, and more).